Productivity or Creativity, did you choose? Did you know creativity could be in direct contradiction with productivity? 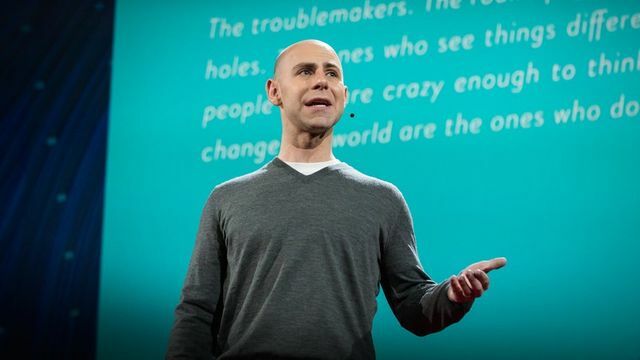 Before I watched this amazing TED Talk on Original Thinkers by Adam Grant (video below), I thought procrastination was bad. Something to be ashamed of. One of the things I used to be the best at. You see, I'm not a native English speaker. I grew up in a country where stores are closed for 2 hours during lunch time, where words are both elegant dancers and mean fighters and time turn wines into liquid jewellery. We call it Art de Vivre. Because we like to think in decades or centuries rather than in hours, the P word is almost impolite in many French circles. Yet this is part of the reason I crossed the English Channel. To betray my very French heritage and learn business from a country which built an empire based on global trade and steam power. So I learned. I focused. I measured. I improved. But then something happened. I started to write for the web. And it was like gallons of slowly matured wine pouring out from the fountains of Versailles. I had forgotten how much I cherished Creativity. How good it was to indulge in the intoxicating fever of making words collaborate and compete with each other. And now this brilliant video explains how creativity is a factor of procrastination (moderate procrastination). And I'm back in the game! Pretty much every self-help guru or business coach has something to say about productivity. But while creativity is worshipped very little is said about how it is triggered and where it comes from. Productivity was the virtue of the 20th century when repeatable was king. Automation will take care of this in the 21st century. Now is the time to Procrastinate. "It's only when you're told that you're going to be working on this problem, and then you start procrastinating, but the task is still active in the back of your mind, that you start to incubate. Procrastination gives you time to consider divergent ideas, to think in nonlinear ways, to make unexpected leaps." Adam Grant, Organizational psychologist. If Creativity is King now, then Collaboration Management is its Queen. And this is how we shine at OmPrompt. At the heart of it all, one of our core values: We design straightforward solutions to complex problems. Simplifying is hard: it requires a lot of creativity and a lot of iterations. We do it by getting great people to collide on what simple and elegant means. Procrastinators and Precrastinators (definition in video - or transcript here), one challenging the other. As Adam Grant puts it "Procrastinating is a vice when it comes to productivity, but it can be a virtue for creativity." - and now, it's backed by science! So don't waste your time trying to be productive. Watch this video, take a walk outside and forget about what you were trying to fix. When you get back to your desk I promise you'll have progressed more than in one hour of trying. Don't agree with me? Let me know why on Twitter @MatthBmrt. I'm also here on LinkedIn. Connected Fridge - Connected Supply Chain?